This trek is a circuit around the famous Paine Massif. 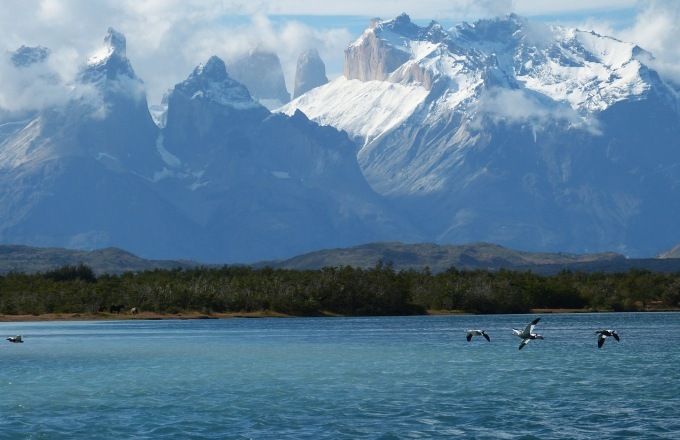 This is the best adventure for trekkers who seek a challenging trip in Torres del Paine and a true wilderness experience. The accommodation is camping every night. Guides provide the tent and trekkers only need to bring a sleeping bag and a sleeping pad. Trekkers only carry a day pack with box lunches and personal belongings. The guides provide two duffel bags and porters will carry them during the trek. Group size is normally 8 to 12 trekkers with a maximum group size of 12. There is 1 guide for every 6 trekkers. Arrival in Punta Arenas and transfer to the park for the evening. Transfer to the Punta Arenas airport in time for an early evening flight.